In a perfect world, energy simulations and design tools would be so well integrated that each time an architect moved a wall, added a window, or changed a lighting specification, the building’s predicted energy performance would be updated and displayed instantly. With that sort of real-time feedback, designers would quickly become skilled at optimizing the energy performance of their designs, and new buildings would be rapidly approaching carbon neutrality. Along the way, other aspects of a building, such as how well it uses daylight, how procuring its material will affect the planet, and even how much it will cost to build, could be similarly tracked and optimized. And all of this would be done while sharing a design seamlessly across disciplines. That world has not yet arrived, and the path to it is strewn with obstacles. But in some settings it is becoming tantalizingly close, thanks to the convergence of data-rich, three-dimensional (3D) design tools, ever-faster computers, and accepted protocols for sharing digital information about buildings across platforms. In spite of the significant investment that designers and contractors have to make to adopt building information modeling (BIM), they are flocking to it because it can reduce errors, streamline costs, and improve the performance of a facility in dozens of ways, not least of which is green performance. In the early 1980s, technologically savvy architecture firms were replacing their drafting tables and pencils with workstations running computer-aided design (CAD) software. By the end of that decade, firms that hadn’t made that transition were in trouble. Through the 1990s, two-dimensional CAD drawings gave way to tools that could create three-dimensional views of a design, and more advanced tools enabled architects to design directly in three dimensions using virtual models. “Working with a model of a building is actually very natural, because it’s what we architects carry around in our heads anyway,” said Mario Guttman, AIA, vice president and CAD director at HOK. Structural engineers working on complex buildings have been among the early adopters of 3D CAD tools, but architects and other engineers now commonly use these tools as well. attaching information to elements in the virtual building. Early uses of BIM have advanced beyond collision detection to focus on specific functions, such as real-time cost estimating. Autodesk’s Revit, for example, is linked to cost data from RSMeans, so a project’s budget can be tracked as the design evolves. Sophisticated contractors are using tools such as Constructor from Vico Software (recently spun off from Graphisoft) to create cost estimates based on their own cost databases and also to model and optimize construction sequencing. The move towards BIM is driven in part by large building owners, including the U.S. General Services Administration (GSA), which, as of 2007, accepts delivery of designs for major projects only as interoperable models. Owners like GSA have documented the wastefulness of the conventional paper-based building delivery process and are dictating a more integrated approach. A handful of BIM-related organizations and initiatives joined forces under the umbrella of the National Institute of Building Sciences (NIBS) buildingSMART Alliance and, in February 2007, released the first part of a national BIM standard for industry review. Autodesk, the 800-pound gorilla in the CAD software jungle, has incrementally added data-linking capabilities to its flagship Architectural Desktop software package. In 2002, the company made a major commitment to BIM with its acquisition of Revit, a database-driven design software package. Autodesk is now actively seeking to migrate its longtime CAD customers into the Revit product line. Currently there are 200,000 licensed Revit users worldwide—doubled from last year, according to Jay Bhatt, vice president for AEC at Autodesk. Other major players in this market include ArchiCAD from Graphisoft (a Hungarian company acquired in 2006 by the German firm Nemetschek), and the Microstation suite of software tools from Bentley Systems. Bhatt estimates that between 5% and 10% of CAD users worldwide use BIM software from one of these companies. As the number of designers working in BIM grows, so does the opportunity for using those virtual models to do more than just estimate costs. Working in two-dimensional, basic CAD drawings, “you had to do all this heroic behavior to create an environmentally sensitive design,” noted Bhatt. With the advent of BIM, however, “technology is facilitating a much bigger movement around sustainability in the buildings space,” Bhatt added. Vincent Murray, business development manager in the Boston office of simulation software company IES, agrees: “BIM opens up building-performance modeling to the entire building construction community,” he said. Energy modelers use specialized software to create a virtual model of a building. They then subject that model to the building’s anticipated weather and usage patterns to predict its heating and cooling loads and energy use. Until now, setting up an energy model took many hours, even for a relatively simple building, so iterations through various design alternatives were slow and expensive. “Now, since the model is available as a given, representing the actual current state of the design, we can shorten this amount of time dramatically,” said Rendek. One of the ironies of energy modeling and other simulations used in the design process is that they tend to require a fairly complete model of the building, which means that by the time the modeling is done, the design is fully developed and only minor changes can be entertained. BIM mitigates this problem to some extent because the integrated 3D design model makes it relatively easy to make changes, even late in the process, by eliminating the need to coordinate changes across multiple drawings. But early-stage simulations from preliminary 3D and BIM models offer the greatest potential benefits. Green Building Studio and (soon) SketchUp are optimized for use in those early stages—specifics on each follow. Kennedy has created plug-ins for Autodesk’s Architectural Desktop and ArchiCAD that assist users in defining HVAC zones and validating the BIM model to increase the chances that the energy simulation will provide useful results. This capability is integrated into Revit, so no plug-in is required. The software generates a file in gbXML format (an information exchange protocol developed by GBS) that the software uploads to GBS’s server for analysis. Minutes later, the designer can download the results of the model. GBS allows users five free runs; more runs are available for a nominal fee. GBS recently introduced a “design advisor” service that automatically generates proposed modifications to the design and allows users to experiment with a small number of alternatives. GBS also makes its DOE-2 input file available for download, offering engineers a shortcut for running their own early-stage energy models. 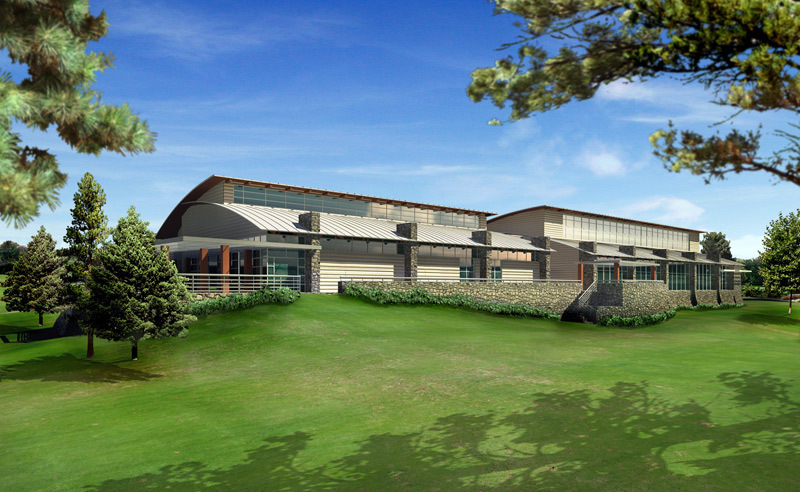 The Georgia State Parks Headquarters in Stockbridge, Georgia, was designed to be environmentally responsible using building information modeling services provided by the independent BIM consultants RCMS Group of Atlanta. SketchUp and EnergyPlus. While it is a far cry from the full-fledged BIM tools, Google SketchUp offers a 3D modeling interface and the ability to assign characteristics to objects in the design. “A lot of designers prefer SketchUp early on because it’s such a facile tool,” noted Chris Leary, AIA, of KlingStubbins. Most mainstream design tools now have at least some capability to import models from SketchUp and to export simplified models out to it. That capability will soon carry more significance for green projects because by June 2007 the U.S. Department of Energy (DOE) expects to release a SketchUp plug-in for the powerful EnergyPlus modeling engine. DOE intends for EnergyPlus, which was released in version 2.0 in April 2007, to supersede the venerable DOE-2. While EnergyPlus is widely regarded as a more powerful and flexible simulation engine, its use has been limited by its lack of a user-friendly front end. “I could imagine that SketchUp would be a pretty good interface for making an EnergyPlus model,” said Kevin Pratt, director of research at KieranTimberlake. The plug-in, which will be available for both the free and the full versions of SketchUp, will help users define HVAC zones and assign thermal characteristics to elements in their models. It will then export an EnergyPlus input file for a user to run separately—although, according to Drury Crawley, AIA, Technology Development Manager at the U.S. Department of Energy, future versions of the plug-in should be able to run the simulation entirely within SketchUp. More detailed energy analyses during design development, or verifying a building’s performance from the construction documents, is the traditional purview of mechanical engineers who specialize in energy modeling. Simply by translating building geometry automatically from a design model, 3D CAD and BIM tools have the potential to dramatically reduce the amount of time and effort required to set up those energy models. As noted above, that translation can be done from Revit and ArchiCAD. A more generic approach, developed by the Industry Alliance for Interoperability, uses a data structure termed Industry Foundation Classes (IFC), although support of the IFC standard has been spotty and the IFC definitions don’t cover all building data exchange requirements. Finally, there are several efforts at direct bilateral connections between BIM tools and performance modeling platforms. The following sections describe how the major BIM software tools support this type of analysis. Revit MEP Links to IES. In February 2007, Autodesk and simulation developer IES Limited announced a collaboration linking their tools. This collaboration began bearing fruit in April, when an incremental version upgrade to the mechanical engineers’ Revit product (Revit MEP) gained the ability to calculate heating and cooling loads directly using an IES engine. IES’s Virtual Environment is an integrated performance modeling package that models energy use, daylighting, computational fluid dynamics (CFD), and other attributes based on a single shared model of the building. 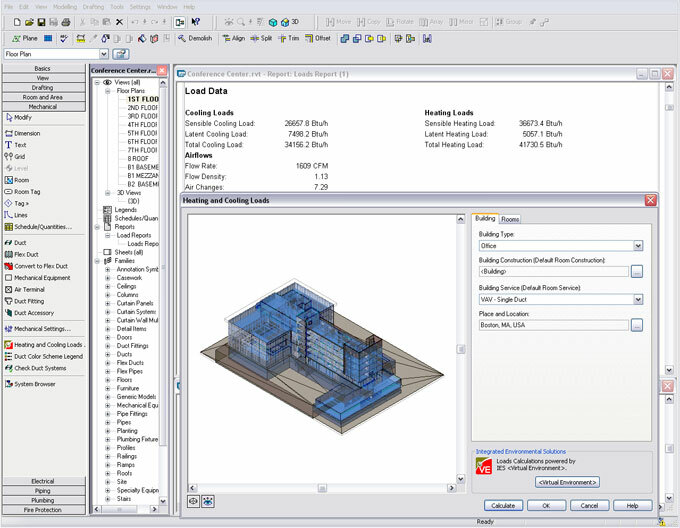 Beyond the load calculation tool that is now provided with Revit MEP, users can purchase the Virtual Environment Toolkit, which includes the ability to do more sophisticated analyses. IES also sells individual modules separately that step up the modeling potential even further. The primary modeling engines within IES are collectively called Apache (unrelated to the Web server software). “Apache is being continuously updated by a team of leading experts,” claimed Murray. KlingStubbins has been an early adopter of both Revit and performance modeling tools. “We’re software junkies—we buy everything,” admitted Leary. “We had IES sitting around, but no one could find the time to use it. Now that we’re not having to recreate the data, it’s getting used.” Leary has seen results from the integration of these tools. In one case, the results of an IES simulation led Leary’s team to narrow a building to allow better daylight penetration. KlingStubbins is now engaged in a firm-wide evaluation of the tools, with engineers in the Philadelphia office comparing the results from IES with those from other modeling tools, and a team in Washington, D.C., examining the CFD analysis. “Who ever thought an architecture and engineering firm would be doing its own CFD modeling?” Leary asked. The fact that IES is tied only to Revit MEP and not to Revit Architectural presents an obstacle in the path towards energy modeling that is fully integrated into the design process, especially since Revit MEP is not as mature as the other Revit tools and some engineers are hesitant to commit to it. Autodesk and IES don’t see the dependence on the MEP module as a limitation, however—they believe the shared model can enhance communication and collaboration across disciplines. “We would hope that the integrated model with Revit would become the catalyst for integrated design,” said Murray. Involving experts in the energy modeling process, even if it is largely automated, is also a good idea in terms of interpreting the results. “If you don’t understand what’s happening behind the scenes, you can get some really misleading data out of the software,” warned Pratt. ArchiCAD and Ecotect. Graphisoft is pursuing a path similar to Autodesk’s by establishing ties with another integrated performance modeling package, Ecotect. Ecotect is used extensively in academic settings and is popular in many firms for early design studies. Architects rave over its intuitive graphic interface. “The advantage of Ecotect is that you can have very visual models showing the results of different scenarios,” said Patrick Mays, AIA, vice president of Graphisoft North America. Ecotect was created by Andrew Marsh, Ph.D., who is originally from Australia but currently resides in the U.K. Marsh and a tiny staff handle all development and maintenance, so keeping up with the demand for features and fixes has challenged them, especially as demand for the tool has mushroomed. Ecotect remains a valuable player in the industry, however, largely because of its connection to open-source tools, such as Radiance for daylight modeling and EnergyPlus for energy, in which Ecotect users can perform more robust simulations that are beyond the scope of its internal code. Graphisoft has enhanced ArchiCAD’s gbXML plug-in from Green Building Studio to serve as a translator to Ecotect. “We have the capability to map zones and export data, so properties of walls, windows, doors, are all tracked,” noted Mays. Right now the export to Ecotect is one-way, but users will soon be able to move Ecotect models back into ArchiCAD, according to Mays: “In two months you will see documentation and process for how stuff will work back and forth,” he said. This screen capture from Revit MEP shows the heating and cooling load calculator from IES Virtual Environment running within the Revit application. Bentley’s BIM Solutions. Rather than linking directly to any specific building-performance package, Bentley Systems instead touts its flexible data structure as an ideal solution because it allows users to store any type of data and migrate that data into third-party tools for specialized analyses. Bentley’s primary vehicle for these translations is the IFC framework, which is finally gaining widespread support, according to Roberts. Roberts says that a unique strength of Bentley’s software is its ability to exchange data back and forth with other tools, including an option to selectively re-import modifications to a model. “The majority of the analysis tools aren’t as smart as BIM,” noted Roberts, “but they have all the processes for dealing with the information they care about—other than the geometry—internal to themselves.” Rather than managing all that additional information in one BIM software package, Roberts suggested that a more effective solution would be to allow the tools to pass back and forth the parts of the model that they do share while allowing any of them to modify the design. While Bentley’s tools have the potential to be a strong, open platform from which to develop energy-efficient design solutions, the company does not appear to have progressed as far as its competitors in supporting or promoting those capabilities. This two-way sharing of data, for example, is already working in the area of structural analysis but not yet in the areas of building performance most closely associated with green design. While the ability to go directly from a design model to an energy simulation is tantalizing, and the capabilities are improving, we still have a ways to go. “It’s not as simple as pushing a button and getting an energy number. Analysis requires a lot of simplifying assumptions, and understanding what is really important and what isn’t,” HOK’s Guttman told EBN. Perhaps the most fundamental challenge is that energy analysis requires a range of inputs, only a few of which are included in a typical building-information model. The physical layout—what software engineers call “building geometry”—is a basic element in all 3D CAD models. Information on how the various elements are constructed and on their thermal performance may be included in a BIM model. But an energy model also needs location information—which it uses to track sun angles and apply appropriate climate data—schedules of operation, and a mapping of HVAC zones. Typcially, most of these additional elements don’t exist in an architectural BIM model, so they must be created either before or after the model moves to an energy simulation environment. Similarly, daylight modeling tools require information about the reflectivity of surfaces, and those that model airflow need to factor in friction coefficients. In this sense, although both conventional design and performance simulations are working from a virtual model of the same building, they need to know different things about that building, making their models quite different. As a result, it will never be possible to take a model that was built just as a visual representation and run a meaningful energy simulation: “I’m a little skeptical that you will actually be able to push a button and get a thermal model,” said Pratt. 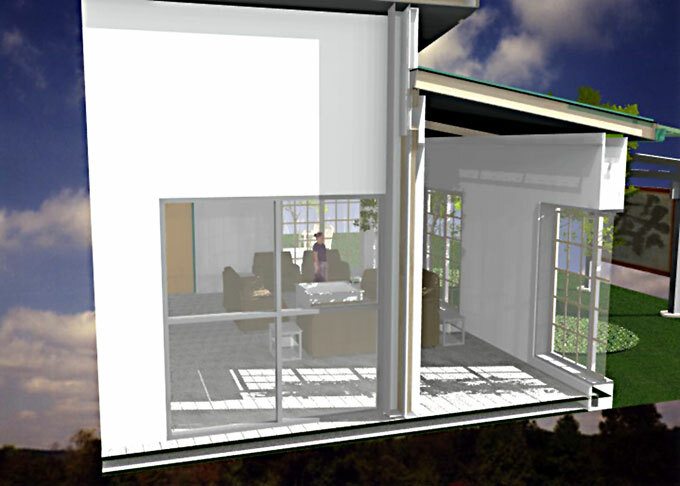 BIM tools can support some analyses internally, such as this daylighting study of a residence, extracted from an animation created by Jeff Owens of Owens Architects in Lawrenceburg, Kentucky, using Bentley’s Triforma software. The full animation is viewable online at www.owensarchitects.com. It’s not only the lack of necessary information that represents a problem; unnecessary information can slow even the most capable simulation engine to a crawl. “BIM gives you the ability to bring over much more detail than you would normally put into an energy simulation,” said Crawly, “but that also has a downside—you can bring over too much data and make the model overly complicated to run.” For example, he noted, including every closet in the model of a large building increases computer processing time without significantly affecting results. Companies, including Burt Hill and SOM, are addressing this issue through the formulation of teams that are expert in energy modeling and other building-performance analyses. These groups are engaged early in the conceptual design process working directly with the architectural design team. This integrated approach provides the design team with expertise in using analytical applications and ensures that Building Information Models contain the appropriate level of information to perform the simulations that can support important decisions. “Our Energy Modeling Team is also engaged later in design to perform more detailed simulations, but it is the early involvement that is important to set the strategies for the building,” noted Mark Dietrick, AIA, chief information officer at Burt Hill. While they may not be ideal for thermal simulations, BIM models are well suited to tracking the materials used in a design. If the model is set up properly, the tedious and error-prone task of measuring each surface and volume to estimate material quantities is eliminated. “The only way to take off quantities accurately is out of a model,” said Bhatt. Accurate take-offs reduce waste, which is beneficial in itself. But in addition to providing an accurate measure of how much concrete to order, for example, a model can also track specific attributes of materials. When constructing a BIM model, designers can select building elements from a library of generic assemblies, or they can create their own libraries. Most models already link to cost information for those assemblies. In theory, they could just as easily store information such as quantities of recycled content or even environmental impact scores from life-cycle assessments of those assemblies. Any information that is available for the individual assemblies can instantly be aggregated for the entire model. “We’d like to make a change and be able to understand, in real time, the carbon impact of the change in terms of embodied energy of the materials,” said Mara Baum of Anshen + Allen. But that proprietary-product-based solution “is very tricky in an architectural context because we try to use generic specifications,” noted Pratt. The fact that the design model is usually generic presents problems when it comes to getting parts from the manufacturer, agreed Roberts. “That’s been tried a few times but has never gained traction,” he noted, suggesting that those product libraries are more valuable when a building model is used during construction. Using information models to manage the construction process offers compelling advantages, many of which also have environmental implications. Software now available allows contractors to scan items for inventory management as they arrive on the construction site, and link them directly to their place in the building model. Eventually, electronic tags might allow contractors to track the location of each item and ensure that it is installed in the right place. Such tools could reduce errors and waste while streamlining the commissioning process. The ability of BIM tools to aggregate materials information and analyze other building information also has intriguing implications for the documentation requirements of rating systems such as the U.S. Green Building Council’s (USGBC’s) LEED. Noting that Adobe System’s Acrobat technology is the platform for LEED Online, “Anshen + Allen wants to work with them on streamlining the information uptake from the model into the LEED docs,” said Rendek. The Portable Document Format (PDF) created by Adobe provides portability and security for sharing BIM information, and Adobe is moving aggressively to enhance the ability to link data to individual elements in a 3D Acrobat file. While PDFs are valuable for sharing information among users before submitting it for LEED verification, in the future the actual submission won’t necessarily require a PDF file at all, notes Max Zahniser, USGBC’s certification manager for LEED for New Construction. “LEED Online was originally built on XML technology, so our templates are submitting XML packets into our database. We went that route so that we could eventually capitalize on the ability for other tools to submit those packets, without users having to go through LEED Online themselves.” Zahniser added that the next major enhancement to LEED Online, as it evolves to support a new underlying structure for LEED, will have more direct data-flow capability. While for now the dataflow into LEED Online still requires that a user log into the website, the information needs are already being streamlined. In particular, the latest release of IES Virtual Environments, which is closely tied to Revit MEP, has a built-in capability to perform LEED’s daylight calculation and report what percentage of the occupied space achieves the required 2% daylight factor. Users also have the option to report those results based on IES’s daylight simulation, and the results of either calculation could be used to demonstrate that a project meets the criteria for LEED’s daylighting credit. As capabilities of this type are expanded and the calculations verified, documentation coming directly from these analysis tools may increase the confidence of design teams that they are submitting documentation LEED will accept, and may even streamline USGBC’s verification process. While the software can’t take all the credit, BIM tools are a key element of a broader trend in design towards integration of design disciplines and knowledge-based decision making. “For us BIM is the technology that supports integrated practice. Without the rich exchange of digital data, we’d be in bad shape,” said Volker Mueller, design technology manager at NBBJ. Real-time performance feedback during design can not only improve the building but also educate designers. “You see the changes and understand what’s going on. It’s not just spitting out numbers—the process of using an iterative tool is educational for us,” Leary reported. Similarly, Kennedy sees his Green Building Studio as a response to the “massive education problem” of getting architects up to speed quickly so they can begin designing buildings with the potential of becoming carbon-neutral. Given the speed at which technology changes, choosing modeling tools is like hitting a moving target. “It’s important to stay open and flexible rather than just following what the software vendors dictate,” suggested Rendek. The fact that only a small subset of designers is currently using BIM tools represents both a challenge and an opportunity. As designers move from conventional CAD to BIM they need training, and younger architects who never worked in older systems may have an advantage. With both green design and building information modeling on geometric growth curves, their marriage is mutually supportive. That’s a good thing, given the demands on the industry to learn quickly how to create buildings that make sense for our times.